AFC Group introduces a new range of fibre optic dome enclosures designed for splicing cables in a number of applications including long haul cable joining, cable repairs and fibre drop offs. AFC Group designs, manufactures and integrates fibre optic communication solutions. 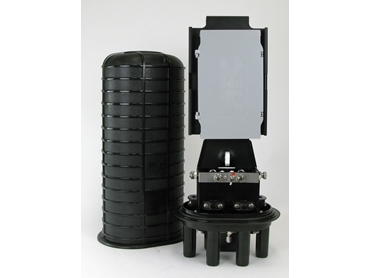 The hermetically sealed fibre optic dome enclosures from AFC are ideal for use in all environments including pole mounting, direct burial, manholes and pedestals. Michael Gauci, Senior Product Manager explains the robust enclosures have an ‘O’ ring seal along with a simple latching mechanism to provide a watertight compartment that can be re-entered if required. He adds they are equipped with a built-in fibre management system that provides a separate area for storing, routing, protecting and expressing fibre tubes. Key features of AFC’s fibre optic dome enclosures include hinged internal splice cassettes providing easy access during installation and repairs, strong polycarbonate construction, and ability to withstand UV radiation and extreme temperatures.